"Hundreds are crying in the streets, hundreds of others are praying and setting up camp here. Some are even panicking and believe this is a sign of the end of the world. I have never seen anything like this in my whole career," says a police spokesperson in Baruipur, West Bengal State, India, about the throngs of pilgrims arriving to see a child born with 4 arms and 4 legs. Although the condition is due to an incompletely formed conjoined twin, it is viewed as divine. 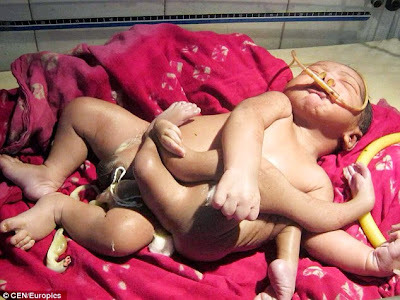 Because multiple limbs are common among Hindu deities, the parents have named him God Boy.